Sandplay provides a very powerful vehicle to explore through metaphor a young person’s internal world. It provides a safe and containing platform to express past trauma and current difficulties. These issues often arise unconsciously, through the process of choosing and placing symbols in the sand. 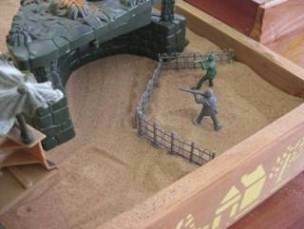 The sandtray will often profoundly mirror a young person’s internal world, allowing the implicit to become explicit. Rather than trying to explain their feelings of anxiety or anger, they can show these powerful feelings through the safety of metaphor and story. Then, through the additional containment provided by the therapeutic relationship they can begin to explore these feelings, and in time will seek to find a way past these obstacles, to reach a calmer internal world. Sandplay has been found to be an extremely effective therapeutic intervention for many pupils.